Beep beep boop, time for work! 'Cause we are livin' in an 8-bit world, and we are 8-bit girls. Or boys, as the case may be.Yep, now you can stick it to the modern-day video game players in your life with this stunning 8-bit tie -- for less! The microfiber tie is $14.99, down from $19.99. You get your choice of red or blue, but no green -- sorry, Luigi fans. This doohickey is a clip-on -- "for T-shirt wear if needed," the folks at ThinkGeek.com helpfully explain. Well, it's also because having a tie knot would instantly destroy that 8-bit illusion. 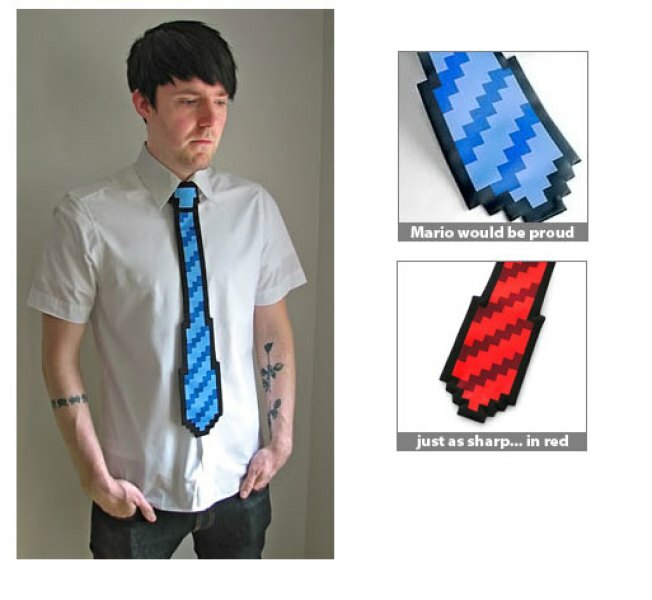 One last sales pitch from ThinkGeek: "This stylish tie looks just like what Mario wore to his high-school graduation!" Annnnnd sold. Kosmos Designs (1010 King St., Alexandria) is known for the ways it incorporates reclaimed teak in its handmade furniture, but don't forget about its smaller accessories, which can add a lot of style to a room for a whole lot less than the cost of a dining room table. Case in point: lamps, including the Matahari Lamp ($235, left), the Black Luka Dot Lamp ($415) and lanterns in warm shades of red, burgundy and chocolate. Just because you're prepping for fall doesn't mean you can't pretend it's still spring. Pastels and pale gray are going to be big this season, and Periwinkle (1557 Potomac Greens Drive, Alexandria) is ahead of the curve. Shown: Anni Kuan Tweed Suit (dress $275; coat $495); Sara Campbell Teal Wool Shift Dress ($425); Sara Campbell Grey Wool Shift Dress with Broach Detail ($378). Periwinkle is recommending red or purple tights and we'll go along for the ride.